Much of the pre-race build-up focused on the rematch between Main Edition and La Pelosa, who were separated by just a neck when first and second respectively in the Albany Stakes at Royal Ascot last month. 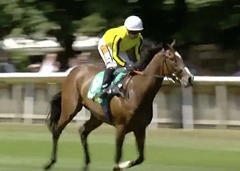 La Pelosa was the marginal favourite to gain her revenge, but both were impeded after Angel’s Hideaway veered right under pressure with over a furlong still to run, by which stage the Michael Bell-trained 20-1 shot Pretty Pollyanna was away and gone under Silvestre de Sousa. The further Pretty Pollyanna went the better she looked and she passed the post a full seven lengths clear of Angel’s Hideaway. Coral make the winner the 12-1 favourite for next year’s 1000 Guineas. Bell said: “Obviously visually it was very impressive. There was a little bit of scrimmaging in behind so some might have been closer, but either way it was a good time and she won very easily so you can’t be more than very impressed with her. On future plans, the Newmarket trainer said: “She is in the Lowther (at York). That’s a possibility, but she has a penalty for that now. There was a huge sting in the tail for runner-up Angel’s Hideaway’s rider Frankie Dettori. The popular Italian was handed a 10-day suspension that will rule him out of the King George VI And Queen Elizabeth Stakes at Ascot on July 28 as well as the entire Qatar Goodwood Festival the following week. The Ralph Beckett-trained Chaleur was a further six lengths back in third. Teddy Grimthorpe, racing manager for owner Khalid Abdullah, said: “We’re very happy. They went a good clip. Once she settled into a bit of a rhythm she was fine and she was really doing her best work at the end. “It is very nice to get Group-placed with a filly like that. The Duchess of Cambridge Stakes was first run in 1947 as the Cherry Hinton Stakes, and the inaugural running was won by Great Fun. The present system of race grading was introduced in 1971, and for a period the Duchess of Cambridge Stakes was classed at Group 3 level. It was promoted to Group 2 status in 1996. The Duchess of Cambridge Stakes is currently held on the second day of Newmarket's three-day July Festival meeting. The equivalent race for male horses is the July Stakes. Several winners have gone on to achieve victory in the following season's 1,000 Guineas Stakes. The first was Sweet Solera in 1961, and the most recent was Attraction in 2004. In 2013 the race was renamed the Duchess of Cambridge Stakes from the Cherry Hinton Stakes. This also came in the same year as the Windsor Forest Stakes at Royal Ascot was changed to the Duke of Cambridge Stakes.